BEIRUT — They always anticipated U.S. support would run out, but President Donald Trump’s abrupt decision to rapidly pull U.S. forces out of northeast Syria has nevertheless stunned the Kurds there, who for the past three years have been America’s partner in fighting the Islamic State group. It stung even more because the Kurds in the Middle East have been abandoned before by the United States and other international allies on whose support they’d pinned their aspirations. What happens next is uncertain because of confusion in the U.S. plans. Initially, Trump declared the pullout of the 2,000 American troops would happen “now,” but White House officials have since suggested it would not be immediate. Further muddling the policy, Trump’s national security adviser John Bolton, on a visit Monday, tried to win assurances from Turkey that Ankara would not harm the Kurds but was apparently snubbed. The Kurds are an ethnic group numbering some 20 million people spread across four nations — 10 million in Turkey, 6 million in Iran, 3.5 million in Iraq, and a little over 2 million in Syria. They speak an Indo-European language, related to Iran’s Farsi, and are overwhelmingly Sunni Muslim. The 191,000-square-kilometer (74,000-square-mile) Kurdish area arcs through a mountainous zone from southeast Turkey to the Zagros mountains in northwest Iran. They’re divided not only by borders but by tribal, political and factional splits that the regional powers have often used to manipulate them. With the Ottoman Empire’s collapse after World War I, the Kurds were promised an independent homeland in the 1920 Treaty of Sevres. But the treaty was never ratified, and “Kurdistan” was carved up. A Kurdish state was briefly established with support from the Soviet Union in Mahabad, northern Iran, in January 1947, but it collapsed 11 months later. Over the following decades, two events have been burned in the Kurds’ memories as betrayals by Washington. In 1972, the U.S. helped arm the Iraqi Kurdish insurrection against Baghdad. It did so on behalf of Iran, then led by America’s ally, Shah Mohammad Reza Pahlavi, who was hoping to pressure the Iraqi government in an ongoing border dispute. Three years later, the shah signed a border agreement with Baghdad and shut off the weapons pipeline. Then-Kurdish leader Mustafa Barzani wrote an impassioned letter to U.S. Secretary of State Henry Kissinger pleading for support, but the American help ended. 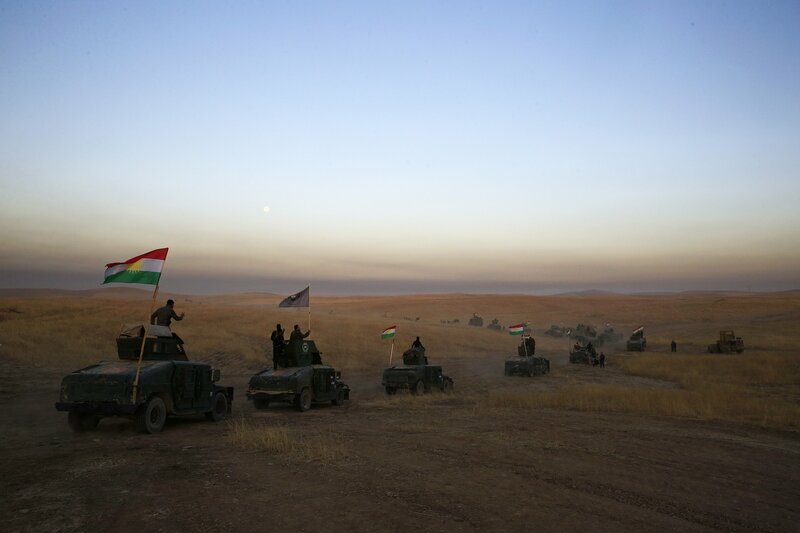 The Iraqi government crushed the Kurdish rebellion. Iraq’s Kurds rose up again, in the 1980s, with Iranian backing, during the Iran-Iraq war. Iraqi leader Saddam Hussein’s army waged a brutal scorched-earth campaign, using poison gas and forcibly resettling up to 100,000 Kurds in the southern desert. The second event came in 1991, after the U.S.-led Gulf War that liberated Kuwait from Iraqi forces. Then-President George H. W. Bush called on Iraqis to rise up against Saddam. The Kurds in the north and Shiite in the south revolted, at one point controlling 14 out of Iraq’s 18 provinces. Saddam responded with a brutal crackdown and while Bush had not explicitly promised support, Kurds and Shiites felt left in the lurch. Still, a U.S.-enforced no-fly zone over northern Iraq helped ensure a degree of Kurdish autonomy there. After Saddam’s fall in 2003, the U.S. helped ensure that Iraq’s new constitution enshrined that autonomous zone. But Washington has drawn the line against Kurdish independence. In September 2017, a referendum in the self-rule region overwhelmingly backed independence. The U.S. opposed it and the Baghdad government took over the zone’s border crossings and closed its airports for months, forcing the Kurds to back down. Syria’s Kurds have hoped for autonomy in the northeast corner of the country where their population is concentrated. The Damascus government has not allowed it, and Turkey is vehemently opposed to it. Ankara views the main Syrian Kurdish militia, which is linked to Kurdish insurgents in Turkey, as a terrorist group. During Syria’s civil war, as Damascus was busy in the fight against rebels, the Kurds succeeded in setting up a degree of self-rule that had been unthinkable before. The situation raises shades of Kissinger in the eyes of some Kurds, he said. “President Trump in the past praised Kurds as great fighters and great people,” said van Wilgenburg.